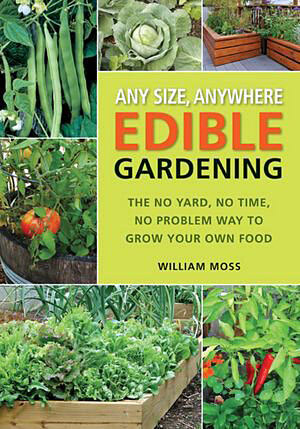 I would have enjoyed Any Size Anywhere Edible Gardening by William Moss (Cool Springs Press, $21.99) when I was in college, worked a couple of jobs and lived in a second floor apartment overtop a parking lot in the university’s no man’s land between city and suburbs. The author, who is an instructor at the Chicago Botanic Garden, offers to space-bound, inexperienced, time-crunched souls both the encouragement and the practical tips needed to grow a little bit of their own produce. Moss, whose breezy delivery welcomes you in, has four mantras that immediately endeared him and his gardening philosophy to me: have fun; don’t stress; start small; and don’t let a lack of knowledge intimidate you. Simply (though not simplistically) written in an accessible style, the book introduces the uninitiated to the basics of small-space gardening then works toward the practicalities of healthy production. Throughout the book, Moss lauds the pleasures and benefits of the enterprise, but also includes such down to earth topics as: soil; sustainability; best management practices; starting seeds, fertilizing and watering; and wildlife ecology — all without getting preachy or overwhelming. In addition to container gardening on balconies, rooftops, and patios, Moss illustrates the space-saving benefits of vertical gardening – for example, sticking a trellis for the peas into the container – as well as the variety of plantable spaces possible — hanging baskets, green walls, whacked-together boxes, cinder blocks, pots, etc. 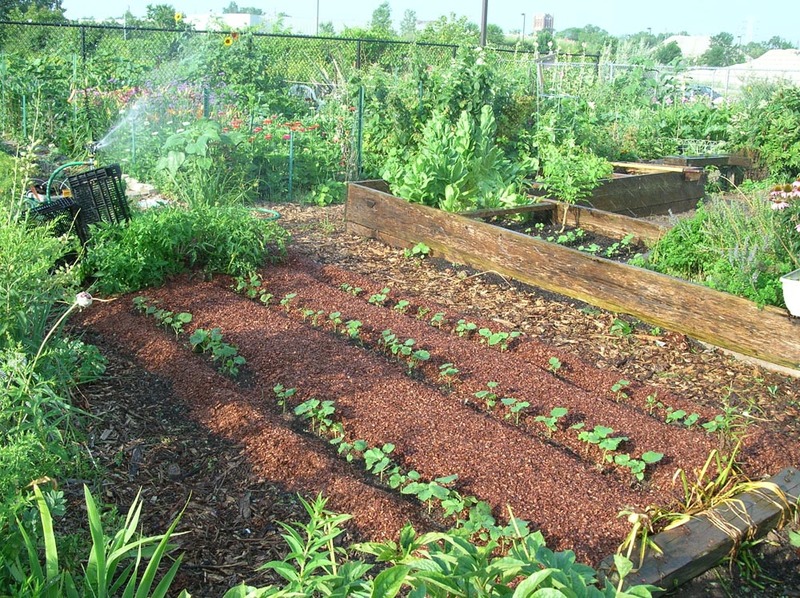 He also reminds readers of the possibility of community gardens – most urban areas now offer a number of community garden spaces. A couple of quibbles: I would have preferred more photos of cramped urban spaces –potted balcony gardens, raised beds on concrete walkways or parking lots instead of what look to be the strategically-photographed corners of larger gardens. While I appreciate his list of vegetable possibilities including beans — especially pole beans, since they tend to be heavy producers over several weeks — I would have liked more vegetable recommendations that would give more culinary bang for the horticultural buck. Things like broccoli or cabbage don’t make all that much sense in a pot or small box–you tend to get one or two, big, much-loved heads for one or two meals — whereas herbs mixed with peas, followed by a tomato or pepper or even okra or two produce more food longer. Likewise sweet potatoes, however pretty the vine, seem less than an economical use of space. To my mind, we can use limited space far better by planting greens such as chard, kale, lettuces, arugula, etc., which you tend to cut and cut again (although I do understand the draw of growing a big climbing squash plant for the drama alone, so maybe it’s just a personal choice). Having said all that, there’s much to appreciate in the book. Moss’s experience, the range of information, which assumes an audience that wants a seed-to-harvest primer, and his everybody-in-the-pool attitude. He’s all about the fun of growing your own food without turning it into a chore. I particularly like the description of a compost pile as an ‘out-of-the-way heap of organic matter that you poke at with a pitchfork from time to time,’ a wonderfully laid-back approach — leaving aside the issue of where apartment dwellers or urban dwellers whose municipalities may have regulations against uncontained refuse that feeds vermin might site one. 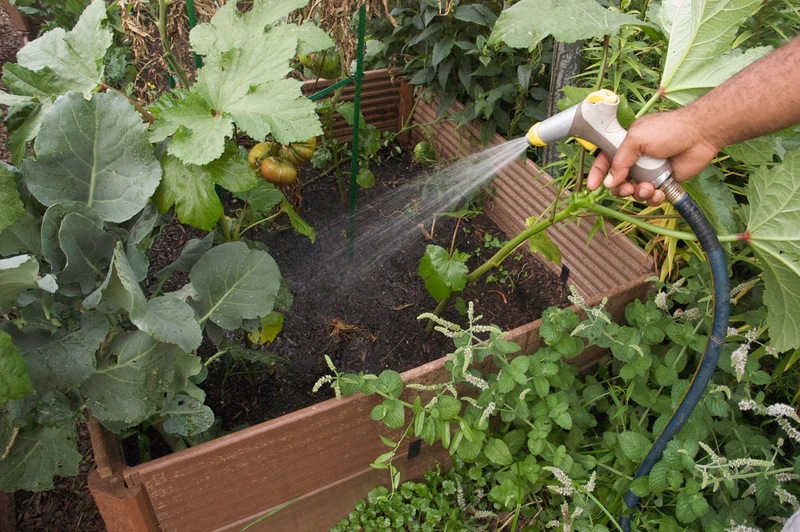 Any Size, Anywhere Edible Gardening: The No Yard, No Time, No Problem Way to Grow Your Own Food is not what I would call the definitive text on the subject, but it’s a good soup-to-nuts starter for those who want to get their food-gardening feet wet. It would make a great gift to a student, an apartment or condo dweller or anyone with limited space and energy, who simply wants to add to the pleasure and satisfaction of their lives by growing a little something to eat. This book sounds like a great one for me to get some new ideas. I don't necessairly have a very small lot, but I have very little sun, making in ground gardening difficult. Rooftop gardening has its hazards, especially on the Dec. 24, when all those reindeer hooves can make a quick salad out of a bed of winter lettuce. Well hello there! It was such a huge pleasure to visit your personal blog and especially to read this blog entry. Also I want to know one thing. What is your attitude towards guest blogging? Hi Elizabeth – We occasionally post guest blogs from people who are involved in gardening (particularly gardening-related organizations) and are Maryland residents. We don't take guest blogs that promote businesses. If you're interested, please write to grow.eat@gmail.com with a brief proposal.